Global trade finance has become an extremely competitive business, mainly suitable for financial institutions with economies of scale or special expertise. Most international trade is now done on an open-account basis, as corporations have come to know their suppliers better and are less willing to pay the fees associated with letters of credit (LCs) and other forms of bank guarantees. While open-account trading is the least secure method for exporting, it represents about 70% of world trade, according to a report by Boston-based Celent, a research and advisory firm that helps banks develop business and technology strategies. Only about 15% of trade is done with the safety net of an LC, with the remainder relying on various documentary collection and related techniques. “Since the trade finance business is globally flat, the best way for leading players in trade finance to increase their volume of business is to acquire market share from the competition,” according to Celent. In order to benefit from the consolidation in the industry, the leading banks are centralizing trade finance operations in regional hubs, investing in technology and providing outsourcing services to other banks. Cash management and trade finance products are being integrated with working capital management and supply-chain services. At the Sibos meeting in Sydney last October, bankers were eagerly anticipating the launch of the Trade Services Utility, or TSU, a bank-to-bank central matching and rules-based engine. TSU operates under SWIFTNet’s messaging system and could help banks automate trade processes and reduce back-office costs. “The TSU is an evolution from the current product suite,” says Antonio Bizzo Lima, general manager of foreign trade and exchange products at Banco do Brasil. “It will help companies reduce costs and help banks enhance their finance and credit products,” he says. TSU uses standardized data and a rulebook that defines the roles and responsibilities of participants. Some 19 pilot banks are using the system, which will become more widely available later this year. Just-in-time manufacturing techniques and the introduction of supply-chain management have reduced the size of individual shipments. A trade deal under $1 million is generally not profitable for a bank to provide trade finance services, according to Celent. And since the value of each shipment is small, the non-payment risk is lower, obviating the need to substitute the credit of a bank for that of the customer. The trade finance business is undergoing tremendous change, but banks that have made the investment in trained staff, technology and global networks are still able to make a go of it. 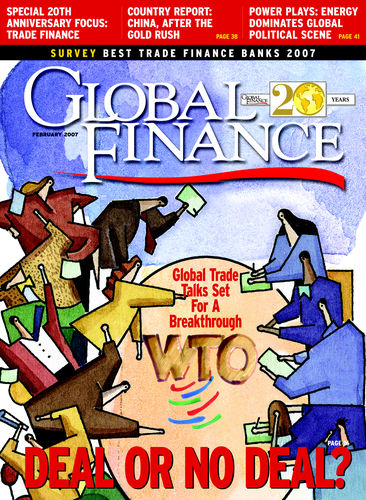 In our seventh annual survey of the World’s Best Trade Finance Banks, Global Finance editors, with input from industry analysts, corporate executives and technology experts, chose the leading trade finance banks in 57 countries or regions, as well as the best online trade finance provider. Criteria for choosing the winners included transaction volume, scope of global coverage, customer service, competitive pricing and innovative technologies.